Bermuda Triangle Mystery Finally Solved? The Bermuda Triangle is a thing of legend, myth and mystery that has been explored in hundreds of TV shows and movies, including its own 1978 thriller. No one has ever had an answer for all the ships that have disappeared in the area. But now a new scientific study claims to have a perfectly good reason why you shouldn't venture too far into this dangerous are of the world. There are strange clouds that really do form above the area known as the Bermuda Triangle, and these clouds are now being blamed for all the ships and planes that have vanished in this legendary swath of sea. The clouds are reportedly linked to what are being called 'Air Bombs' that travel at 170 miles per hour, and are capable of taking out a big sea faring vessel or any type of aircraft that may be flying directly through them. Meteorologists speaking on Science Channel 'What on Earth?' have revealed these findings. They've used their radar satellite imagery to show off their discover: bizarre hexagonal-shaped clouds that are between 20 and 50 miles wide that form over this area of Earth. Meteorologist Dr. Randy Cerveny explains. "The satellite imagery is really bizarre. The hexagonal shapes of the cloud formations. These types of hexagonal shapes in the ocean are in essence air bombs. They're formed by what is called microbursts and they're blasts of air." These blasts of air are extremely powerful, and can reach speeds of up to 170 MPH, comparable to the force of a hurricane. And that is certainly enough to sink a ship and knock a plane out of midair while in flight. Which is actually pretty scary and could inspire a whole new batch of movies based on the strange phenomena. 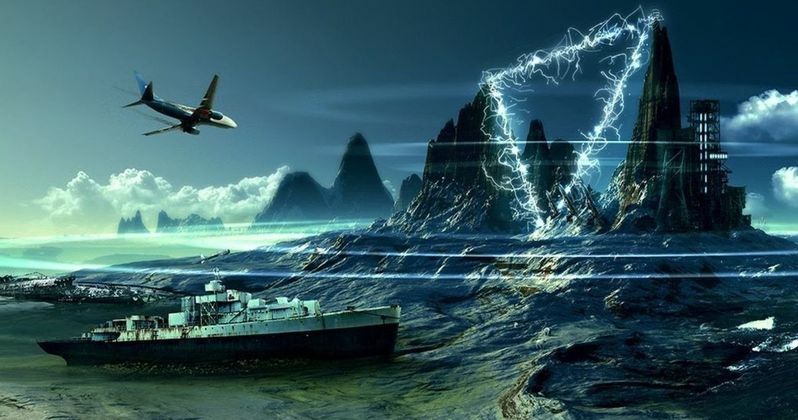 For centuries, the legendary Bermuda Triangle has been blamed for eating up ships and planes without explanation. The area stretches between Miami, Puerto Rico and the island of Bermuda, and we're sure you've heard the warnings at some point in your life. The reasons for the loss and mystery have been pondered and speculated on for years, with everything from UFOs to Sea Monsters blamed on the phenomena. The actual reason sounds just as terrifying. You can check out the trailer for the 1978 movie The Bermuda Triangle, which has a very In Search Of Vibe. We also have the video report from the Science Channel.